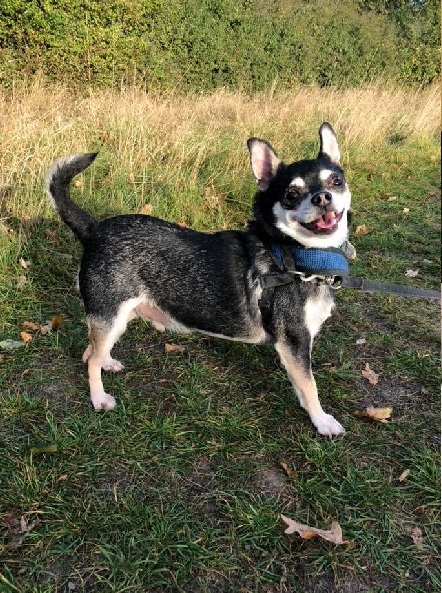 Barkley is a cute little Chihuahua who is around 10 years old. He has a lovely black coat with markings of grey and is currently in a foster home under the care of Change a Paw Life Rescue in Essex. Barkley loves his walks and happily covers a daily 45 minute walk then sleeps the day away. He would suit an older, quieter home and can be around children aged 10+. He is currently living in a multi-dog household, but he would be best homed with either another dog or he would happily lap up all the attention being an only dog. Barkley does not like entire dogs, so all resident dogs would need to be neutered. Barkley will chase cats but only due to being inquisitive. However, to prevent unnecessary stress to a resident cat, a cat-free home would be better or at least a very dog-savvy cat. It’s doubtful he would intentionally harm a cat but he could irritate one. On arrival, Barkley did display issues with dry eye but this has cleared with eye ointment. He has been neutered. Please mention that you saw Barkley on the Oldies Club website.